The Oppo N1 is an NFC smartphone that features a rear touch panel and a Bluetooth keyring accessory. The N1 comes with O-Click, a Bluetooth-based keyring that allows the user to trigger an alarm when the phone is lost or snap a photo from a distance. 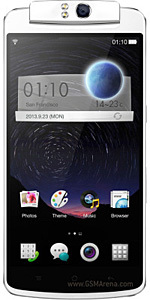 The device runs on Oppo’s own Color OS, based on Android 4.2 Jelly Bean, and will be available in 16GB and 32GB versions from December 2013. A limited edition model running CyanogenMod will also be available.. The N1 is powered by a 1.7GHz Qualcomm Snapdragon 600 Quad Core processor with 2GB RAM and includes a 13 megapixel dual LED flash camera that rotates to face the front or the read, a 5.9-inch full HD multi-touch screen and O-Touch — a 12cm² rear touch panel that allows the user to scroll and select items without impeding their view.